Beginning Feb. 23, there will be trail repair work along the Burke-Gilman Regional Trail in the vicinity of the Kenmore and Bothell city limits. 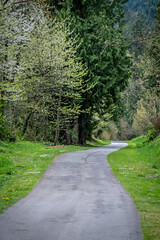 Trail users will be routed onto a short detour along NE 175th St., adjacent to the Blue Trees art landmark at Swamp Creek, while repair work takes place at the Swamp Creek Bridge along the trail. Also, approximately an 1/8th of a mile east at 84th Ave NE, there will be 185 lineal feet of slump repair work taking place. Trail users will be asked to dismount and walk this stretch along the trail adjacent to and for the length of the construction area. Placement of new asphalt for a new smooth transition from the asphalt to the bridge. Given the favorable weather forecast next week, the work at these two areas will be taking place over four consecutive days between Tuesday, Feb. 23 and Friday, Feb. 26. If there are any questions related to this work, please contact Chris Erickson, King County Parks Project Manager at, (206) 477-4564 or via email. Thank you for your patience and cooperation during this important repair work.